Years ago when contractors wanted to hide imperfections in their work; they would apply a textured ceiling commonly known as a popcorn ceiling. 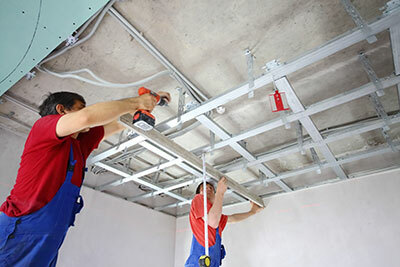 If you are not happy with the appearance of your ceilings, turn to the professionals of “Drywall Repair Lynwood”. While this type of finish is generally easy to apply, it is not a favorite amongst most people today. We help hundreds of homeowners by removing this unsightly type of ceiling for them. There are precautions that need to be adhered to which only a professional popcorn ceiling service would understand. We take our job very seriously and follow every precaution necessary to ensure that you and your family are protected. If you have a popcorn ceiling, you may be wondering why anyone would ever want to have it removed, other than because they find it unattractive. One of the reasons some people choose to have this type of ceiling removed is because it may contain asbestos. Asbestos was used in the process of applying popcorn ceilings during the 1960’s through the 1970’s. If your ceiling begins to chip or pieces fall down from it, it could begin to cause you or your family members complicated health problems. The ceiling will have to be tested for asbestos prior to working on your ceiling. Since this is such a serious health risk, the job should only be handled using a professional popcorn ceiling removal service, such as Drywall Repair Lynwood. Having this type of ceiling may also cause problems when you are trying to sell your home. Prospects may steer away from your home as soon as they see the ceiling. They may either find it unattractive or may not want the extra expense of having it removed. If you have this type of ceiling and want to make improvements to your home, you may simply opt to paint it. This can be very challenging because of the extreme texture of a popcorn ceiling. Paint rollers are not practical for painting it and using paintbrushes will take a long time. These are just some of the reasons that many people choose to have a popcorn ceiling removed. Call today and find out how we can handle your popcorn ceiling removal.